The United States Congress designated the Owens Peak Wilderness (map) in 1994 and it now has a total of 73,868 acres. All of this wilderness is located in California and is managed by the Bureau of Land Management. Owens Peak, the highest point in the southern Sierra Nevada Mountains at more than 8,400 feet, stands near the center of Owens Peak Wilderness. It presides over mountainous terrain with deep, winding canyons, many with rich riparian vegetation fed by bubbling springs. 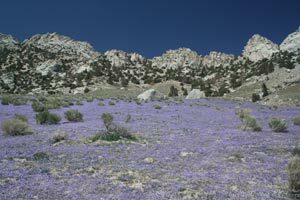 The Sierra Nevada meets the Great Basin and the Mojave Desert here, creating an unusual ecosystem. You'll find creosote bush scrub communities on the bajadas; scattered yuccas, cactuses, flowering annuals, cottonwoods, and oaks in the canyons and valleys; and juniper and piñon woodlands with sagebrush and digger pines on the upper elevations. Mule deer graze beneath golden eagles and prairie falcons. You may see evidence of active human use of this area dating back to prehistoric times. The Pacific Crest Trail crosses through the area north-south. Other trails leave the PCT to dive off the crest and eventually intersect with roads outside the Wilderness. Planning to Visit the Owens Peak Wilderness? How to follow the seven standard Leave No Trace principles differs in different parts of the country (desert vs. Rocky Mountains). Click on any of the principles listed below to learn more about how they apply in the Owens Peak Wilderness.